Caribbean anoline lizards are a particularly interesting example of an adaptive radiation. These lizards provide not one, but four separate instances of adaptive radiation, because anoles have diversified largely independently on each island of the Greater Antilles (Cuba, Hispaniola, Jamaica, and Puerto Rico). Multiple independent radiations within a clade are not uncommon; what is notable about Caribbean anoles is that these independent evolutionary theaters have produced extraordinarily similar radiations. On each island, lineages have diversified resulting in species occupying a wide variety of ecological niches. Furthermore, the same set of ecological types, termed "ecomorphs", have evolved on each of these islands. Six ecomorph classes have been identified. Each one refers to a set of morphologically and behaviorally similar species that utilize a similar part of the environment. 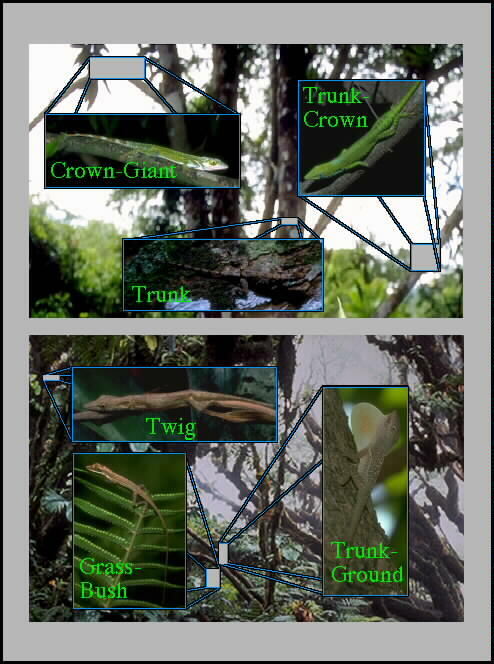 These ecomorphs are named for the part of the arboreal or terrestrial environment they most frequently use: trunk-ground, trunk, trunk-crown, crown-giant, twig, and grass-bush.